MLS founding team and two-time league champions Sporting Kansas City today revealed their 2019 home kit by adidas. The new look SKC jersey will be on sale at World Soccer Shop, Kitbag, Pro:Direct Soccer and UK Soccer Shop. According to Sporting KC: The 2019 primary jersey combines Sporting KC’s customary colors with Raw Grey, the new tonal accent color of the kit’s diagonal stripes. The uniform features a Sporting Blue background with a Dark Indigo collar, numbering, Ivy Investments wordmark, adidas Three Stripes and diagonal-striped jock tag. Grey shorts and Sporting Blue socks with SKC initials round out the full uniform. 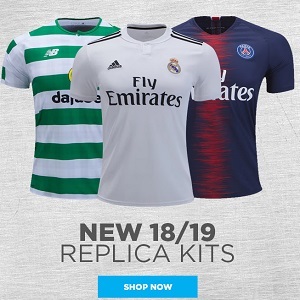 The new kit will accompany Sporting’s black and metallic silver secondary jersey, introduced last year, throughout the 2019 season. The Sporting Kansas City 2019 home shirt introduces a new kit design from adidas Football with a class soccer jersey crewneck accompanies by adidas stripes on its fronts. The diagonal stripes on the front of the kit may also be part of the new template.